The first training block for the 2011 season ended today. The intention of these four weeks has been to focus on running and bring it back into form, whilst the emphasis was there the month felt like a transition. I’ve moved from genuine down time to around 15 hours training per week, not a lot by previous standards, but I’m happy with progress. I’d not taken a real break in some time, often ‘easy‘ periods contained elements of serious training. A classic example is the 40km swim week in the five weeks off after Ironman New Zealand. I don’t think that counts as an easy week in anyone’s book! Rest in October was genuine I logged some zero weeks without any training. Worried it would become habit I started exercising in early November, but it wasn’t till six weeks after Kona I really trained. It’s remarkable how much effort was needed to return to regular training. Shortening days and colder weather didn’t help, the novelty soon wore off and became a further temptation not to train. I mentioned this in my Endurance Corner column on winter training. The only way to overcome my lethargy was to trick myself back to work, for every temptation to avoid training I needed a motivator to push me on. The balance of temptation and motivation defined the month. Despite claiming more realistic expectations I still overestimated my initial capacity to train, misjudging my enthusiasm as opposed to fitness levels. Returning to swimming proved a physical challenge, but for cycling and running it was a case of having the will to do the work. The body could handle sufficient loads, but the mind wasn’t keen on the cold outside or the boredom indoors! Running was prioritised, but the previous gap in training meant little volume or intensity was possible at this stage. I ensured I completed every run workout, but knew there was time and energy available for other training. Were it the middle of summer and my motivation on top form I’d have been in the pool and on the bike daily. As snow fell outside the main objective was to build towards a regular training program in all disciplines. Success would be measured by consistency not performance. By that standard the month was a reasonable success. Running really came on, with the help of an Advent Run Challenge I ran for thirty minutes every day, definitely consistent. Week on week I added swim sessions comfortably raising volume to the point I feel like a swimmer again. My only wobble was with cycling, I failed to develop real consistency with training patterns heavily tied to the weather and insufficient indoor sessions. Managing three weeks of daily running needed a proactive approach to injury prevention. I deliberately held back pace (rare occasions when I didn’t had significant impact on my legs) and put a heavy focus on gym work and massage. A few hours in the gym, fortnightly massage and three Trigger Point roller sessions a day maintained my run legs. The temporary discomfort offset by the knowledge that it was keeping me running. There’s a long way to go before I’m ready for Austria, but then I’d no expectation of being close at this point. It’s easy to become disappointed with progress when you compare to the final target. This block was a run block and delivered on that front, I’ve gone from no running to over three hours a week. There’s no long run, no hills, no tempo, no intervals, but there’s running and an upturn in fitness. Besides the block’s primary goal I managed to maintain cycling all be it in an ad hoc fashion. It wasn’t my intention to develop significant bike fitness and I didn’t, but in light of the low run load I could have done more. Similarly I could have swum more, the time was available, but rejoining a squad and growing volume weekly has delivered a lot. There was room to perform better all round, but as things stand I’m roughly on target. Run block two begins tomorrow. Having established consistency I’m looking to build on this with an aim of increasing volume and a longer run in the week. I want to reach mid-January capable of a structured run week and developing Ironman pace. I’ll look to continue the progression in swimming and despite it not being the current emphasis to build consistency in cycling. When I outlined my planning process I stressed the advantage of using feedback as a guide for subsequent training. The biggest message is I’m failing with cycling consistency. Performance is there, but I need to address the problem with motivation to regularly train. Given the success of the Advent run challenge I’ve decided to opt for something similar on the bike, the goal to ride at least an hour every day. 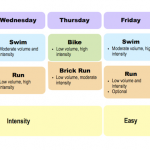 Unlike running an hour of riding won’t impact bike fitness, sufficient weekly training stress needs a mix of intensity and duration. An hour alone isn’t effective training, but will encourage consistency. By the end of the next block I’ll be habituated to riding whatever the circumstances and have no problems just getting on with the work that’s needed. The challenge is to overcome motivational issues, with those behind me I can work more on fitness. I’m not surprised by the mixed return to training, it’s hard when you take time off and an unfamiliar climate didn’t help. Much as I’d love to be reporting a superb month’s training I’m pleased to be able to draw positives and see the foundations for the year ahead. Two or three months down the line I’m expecting much more, a few days from Christmas I’m happy with how things are.